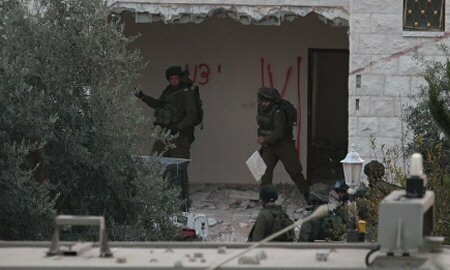 Israeli occupation forces demolished, on Wednesday at daybreak, the house of slain Palestinian Saleh al-Barghouthi, in the village of Kobar, northwest of the occupied West Bank city of Ramallah. Local Al Ray sources reported that a large Israeli military force, accompanied by bulldozers, broke into the village, circled the house of al-Barghouthi, with several soldiers deployed on the rooftops of neighboring houses, and commenced destruction of the house. Omar al-Barghouthi, Saleh’s father, stressed that the demolition of their house will not ruin their will and determination, adding that sons are priceless, and that Palestine is worth sacrificing for. The chairman of the Kobar village council said that the house of al-Barghouti is the fourth to have been demolished by Israeli forces for the past two years. He asserted that they will not allow Israeli authorities to displace any Palestinian family over this criminal attack, adding that these crimes will never affect the spirits and steadfastness of the Palestinian people. It’s noteworthy that the Israeli military had accused 29-year-old Barghouti of carrying out a shooting attack near the illegal “Ofra” settlement, in Ramallah, along with his 33-year-old imprisoned brother Assem, whose house was also demolished last month.